Application reinforcement shower trays with glass fiber and ECOMAG, product “styrene free” developed by MAGMA MACCHINE suitable also for bathtubs. The plant DPR is structured with matching criterion modular storage, dosage and automation in the delivery of the product and with the possibility to adapt the proportion of application. The layout of the plant is designed to meet the specific needs of the customer depending on the type of use and the type of materials used. Example of application of polyurea for waterproofing pools using MS-LC K09. Plant MGP2 added on continuous line for gluing by pouring between rockwool panels and metal sheet. Will highlight the characteristics of movement on one axe and the washing dispensing head system. 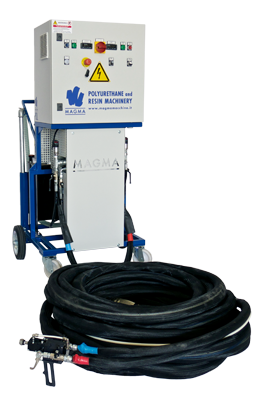 Example of application of PU rigid foam covering under roof floor performed by MAGMA ISOLAMENTI using equipment MS K09. After the insulation the surface is covered with traditional tiles or with other types of materials or panels. MC Presentation and casting example of bicomponent resins mixed. Hard Coating application tests on polystyrene chairs, sofas and benches. Multicomponents discontinuous dosing plant for flexible foam. Plant MGP1 performed for ORMA Macchine. The plant is added on a Orma Macchine discontinuous line for gluing by casting of rock wool panels and metal sheet. Will highlight the characteristics of movement on two axes and the washing dispensing head system. In the movie you can see the simple steps necessary to maintain the HMG gun that MAGMA MACCHINE has developed according to the experience gained on site from MAGMA ISOLAMENTI. The machine MS Smart is the result of years of direct experience in the field of spraying, pouring and injection of bi-component materials with output 4,5kg/min R1:1. The equipment doses, mixes and dispenses at high pressure, using as standard, self-cleaning mixing heads. The field of work changes from rigid and flexible expanded foams, to the adhesives, to the several filled products and to the coating with elastomers, polyurea and RIM. The reduced dimensions and high reliability allow a high quality standard of work and a special handling. Hard coating application tests for bathtubs reinforcing. The application shows the reinforcement through hard coating of the insulating material used to coat the exhaust collectors of marine engines. Coating tests with polyurea Bayer on flexible foam. Gluing tests with DOW product on flexible foam. Example of application of PU rigid foam covering sheet metal performed by MAGMA ISOLAMENTI using equipment MS K09. After the insulation the surface is covered with traditional tiles or other types of materials or panels. Example of polyurea application on EPS using MS-LC K04. PU foam spray application on vertical surface with MAGMA equipment. Plant MGP1 performed for ZONTA COLDLINE company producing isothermal panels for van. The discontinuous line gluing polystyrene panels with EPS sheets is fully customized according to customer requirements. Will highlight the composition of the plant with the structure for the car movement and the characteristics of movement on one three with the washing dispensing head system. You may notice the system components such as tanks, supporting structure for the movement of the chariot and accessories. On the application phase you see the movement on three axes of the dispensing head washing system. Plant MGP1 performed by MAGMA MACCHINE. The plant is added on discontinuous line for gluing by spraying of rockwool panels and metal sheet. Will highlight the characteristics of movement on one axe and the washing dispensing head system. The application shows the construction of the reinforcement structure of filters for competition by casting rigid polyurethane in mould. Subscribe to Magmamacchine channel to stay updated on the videos of our applications.